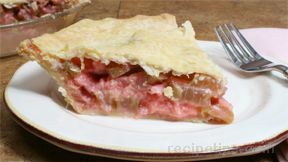 "I haven't made many pies and very few double crust pies because I never feel ... read full review"
Making a double homemade pie crust is basically the same as making a single pie crust. 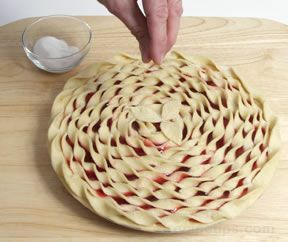 The same techniques are used when learning how to make a pie crust whether it is for a single or double pie. 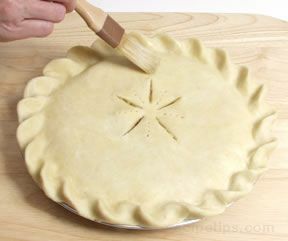 Once you have mastered making homemade double pie crust you can experiment with Decorative Tops. 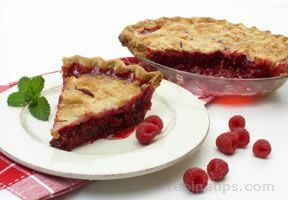 The tips on how to make a pie crust and the easy pie crust recipe below will help make your homemade pie crust a success. Be sure the butter or margarine is cold when you start mixing it with the flour. 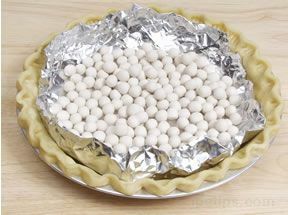 When adding water to moisten the flour and butter mixture, be sure the water is ice cold. Work on a cool surface if possible and be sure the kitchen is cool. 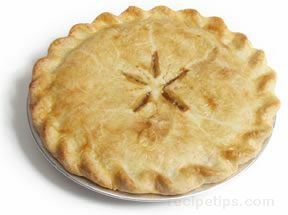 Avoid making crust on a hot day unless the room is air-conditioned. Do not overwork the dough and work as quickly as possible. Chill the dough before baking. 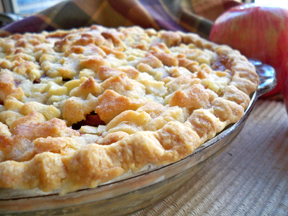 A metal or unglazed ceramic pie plate is the best type of pan to use. In a large bowl, mix the flour and salt together. 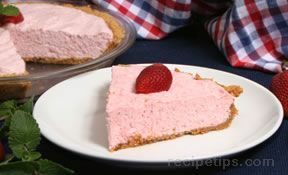 Using a pastry blender or two knives, cut in the chilled shortening and butter (or margarine). Work the mixture only until it forms coarse crumbs that resemble tiny split peas. See Single Crust. Sprinkle the flour and fat mixture with 4 tbsp. of ice water and gently mix together. If the dough seems dry, add more ice water, one tablespoon at a time. Only add enough water to make the dough hold together. 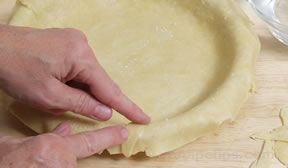 Test the dough by pinching a small piece of dough between your fingers. If it holds together you have added enough water. Mix quickly and gently. See Single Crust. 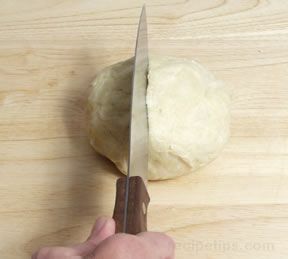 Gather the dough and cut in two to form two balls, one being slightly larger than the other. Be careful that you do not overwork the dough. Flatten the larger ball of dough into a 4 to 6 inch disc and place on a cool, lightly floured surface. 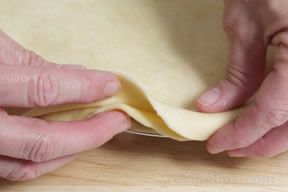 The dough can also be rolled between two pieces of wax paper or rolled out on a pastry cloth. Place the other ball of dough in the refrigerator until it is needed. Starting in the center of the flattened disc, roll outwards. 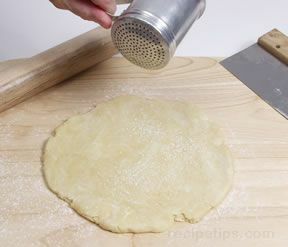 With every couple of rolls, turn the dough a quarter of a turn to produce a round uniform crust. Sprinkle the dough lightly with flour when it shows signs of sticking. Only add flour when necessary. 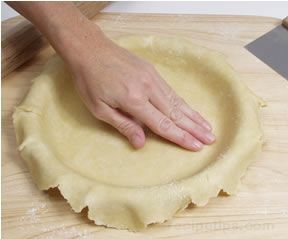 Roll crust to approximately 1/8 inch in thickness and 2 inch in diameter larger than an inverted 9-inch pie plate. 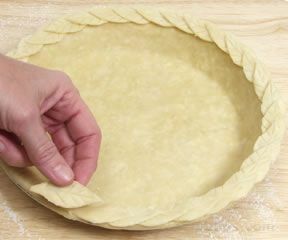 To transfer the crust to the pie plate, partially wrap the crust around the rolling pin and gently lift the crust into the pie plate, being careful to get it centered over the plate and not stretch the dough. 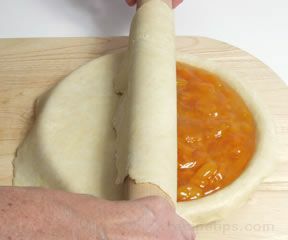 Once it is in place, unroll the crust from the rolling pin. 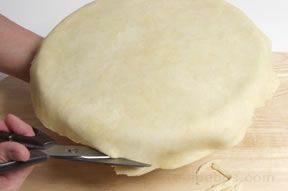 Gently press the crust against the bottom and sides of the pie plate and trim the overhang to about 1/2 inch. 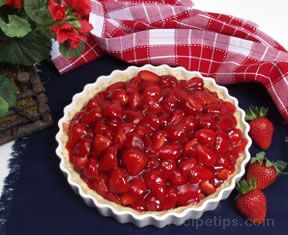 Place the pie plate with the crust in the refrigerator while preparing the filling and rolling the top crust. 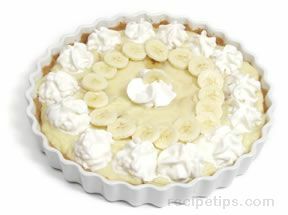 If saving the trimmings for decorating the pie, wrap them in plastic and refrigerate until ready to use. Prepare the filling and then remove the remaining ball of dough from the refrigerator and roll out in the same manner as the first. Make this crust approximately 10 inches round. 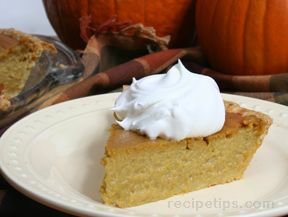 When using a moist filling, it can cause the crust to become soggy. 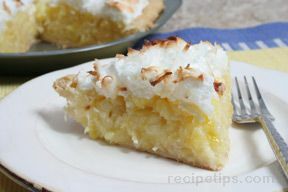 To prevent crust from becoming soggy, coat the bottom with egg white by placing a whole egg in the bottom of the crust. 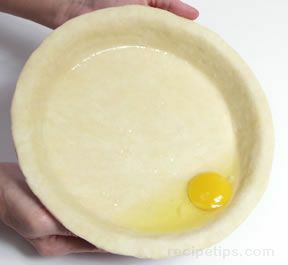 Carefully swirl the egg around to coat the bottom and sides of the crust. Pour out the remaining egg white and yolk when bottom and sides are well coated. 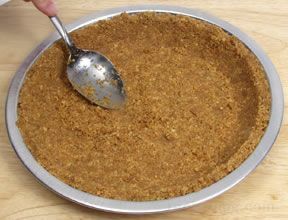 Fill the chilled bottom crust with the filling and then moisten the edge of the crust with water. 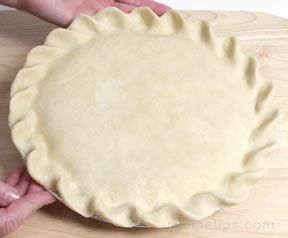 Then center the top crust over the filled bottom crust. 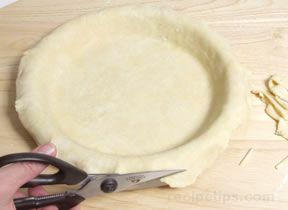 Trim the overhang to be slightly longer than the overhang of the bottom crust. 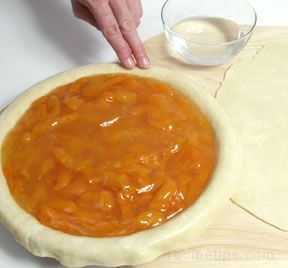 Fold the overhang under so that the top crust folds slightly over the bottom crust. 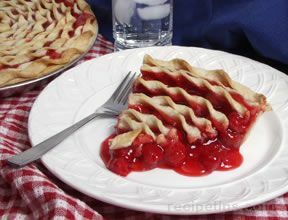 Fold both crust under so they are flush with the rim of the pie plate. Flute the edge or press with a fork to seal the crusts. If you prefer a thinner edge to your crust, leave less overhang on the top and bottom crust when trimming. 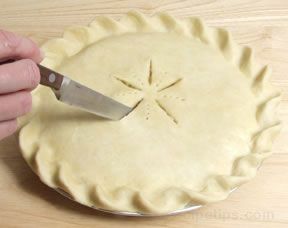 Make slits with a knife or poke holes with a fork in the top crust to allow steam to escape while the pie bakes. To create a more attractive crust, brush with egg whites to glaze it. 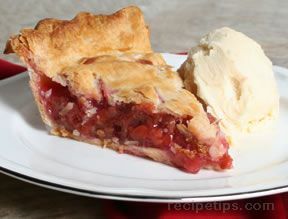 "I haven't made many pies and very few double crust pies because I never feel like I know what I am doing. I found this information and used it this weekend. 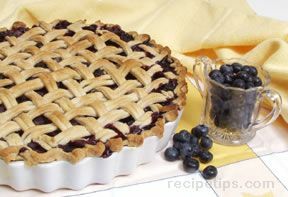 It really helped me feel a little more confident in what I was doing and my blueberry pie turned out pretty good. 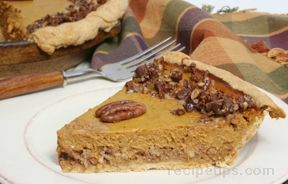 I still need a little practice on rolling out the crust but it went much better." 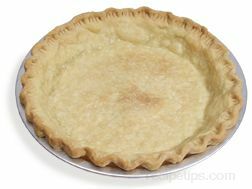 "A great straightforward description of how to make a double crust pie, clear instructions great pictures and the best standard recipe."